This is the time when we often reflect on the past year and think about our aspirations for the upcoming year. I decided to review my tasting notes from 2012 to see what I have learned about myself and the wine consumed. Looking over the list, it is quite obvious that I have a “love affair” with California. I love the Cabernet/Bordeaux blends, Pinot Noir and Chardonnay. Over half the wine I consumed or tasted in 2012 was from California. Now you might think I have a “thing” for overripe, over extracted, high alcohol wines. That’s partially true. I do enjoy a big red wine, assuming that is has been properly aged and decanted for hours before consumption. Some of my favorites this year included: 2002 Bryant Family Vineyard Cabernet Sauvignon, 2003 & 2004 Robert Young Estate Cabernet Sauvignon Scion, 2005 Altamura Cabernet Sauvignon, 2004 Bond Melbury, and 2005 Quintessa. I have also enjoyed some great “terroir” driven Pinot Noir: 2000 Marcassin Blue Slide, 2003 Marcassin Three Sisters, 2007 Hirsch Vineyards San Andreas, and 2009 Morlet Family Vineyards Coteaux Nobles. I have had some great California Chardonnay this past year – too many to list but I will “name drop” my favorite producers: Mt. Eden, Ramey, Brewer-Clifton, Peter Michael, Aubert and Marcassin. These golden wines are often overripe with tropical fruit, oaked with vanilla, sweet baking spices, caramel or toffee and are 100% malo. In my opinion, these wines are crafted to perfection and are worth the splurge! Here are some other great California producers to check out: Belle Glos, Donum, Paul Hobbs, Spottswoode, Stonestreet, Vineyard 7 & 8, and Williams Selyem. This year I’ve taken the time to explore the lovely white wines of the Loire Valley – Sauvignon Blanc, Melon de Bourgogne and Chenin Blanc. Sauvignon Blanc (from Sancerre and Pouilly-Fumé) is bright, fresh and fruity. There is tart citrus, stone and tree fruit along with gooseberry and a fresh greenness. These primarily dry wines are mineral driven with high acidity. They pair well with fresh cheeses or shellfish. Melon de Bourgogne (Muscadet Sur Lie) is primarily grown in the western region of the Loire Valley near the Atlantic Coast. Muscadet Sur Lie is left on the lees for the winter allowing the development of yeasty aromas along with mineral, saline and subtle fruit and floral notes. These wines pair well with shellfish and fish. Chenin Blanc (from Vouvray and Savennières) is the most complex and versatile of three. It can be made in varying styles and degrees of sweetness. There are riper tree fruit and citrus (off-dry wines may have aromas of melon and tropical fruits along with honey, ginger or marmalade). There are also oxidative notes such as bitter nuts, cheese rind or bruised fruit. These wines are also quite floral with green or herbal notes. There is higher minerality and acidity to balance out the wine. These wines pair well with cheeses, shellfish, fish and poultry. “The Sweet Life” comes to mind when I think of Vin Santo. While in Italy this past summer, I had the opportunity to enjoy Vin Santo with biscotti after dinner most evenings. Vin Santo is a dessert wine made in Tuscany from primarily Trebbiano and Malvasia and sometimes Sangiovese. The grapes dry on straw mats or hang from racks indoors in warm, well ventilated areas allowing the moisture in the grapes to evaporate and concentrating the sugars and flavors. The grapes are fermented with a small amount of finished Vin Santo from prior years which adds complexity to the wine. The wine is then aged in small barrels made from oak, chestnut, juniper or cherry wood which allows for oxidation. The wine is usually aged from three to ten years depending on where it’s produced. 2012 was a great year for drinking wine and exploring new and exciting wine varietals and regions. There were many hits with very few misses and I even indulged in the mandatory New Year’s Eve Champagne. Amarone – Drink to the Bitter End! I recently attended the Amarone Families Tasting Event at the New York Public Library last week. The Amarone Families or Familie Dell’Amarone D’Arte is an organization of 12 historical producers of Amarone (Allegrini, Begali, Brigaldara, Masi, Musella, Nicolis, Speri, Tedeschi, Tenuta Sant’Antonio, Tommasi, Venturini and Zenato) in the Valpolicella area. Their mission is to uphold the traditions with a commitment to quality and innovation. Amarone della Valpolicella DOC is produced in Valpolicella within the province of Verona. DOCG status was recently awarded and will take effect with the 2010 harvest. There are 19 communes with the 5 westernmost (San Pietro in Cariano, Sant’Ambrogio, Fumane, Marano and Negrar) classified as the “classico” region. The classico region is the original area with the oldest vines, steepest slopes and best terroir. The classico region is known for higher quality and more stringent rules regarding yields and aging. Valpolicella, meaning “Valley of Cellars”, consists of numerous valleys each with their own microclimates resulting in diversity of the Amarone produced within Valpolicella. Amarone is a powerful and sometimes bitter red wine made from Corvina (45% to 95%) blended with Rondinella (5% to 30%) and/or Molinara (5% to 10%). Other local varieties are permitted such as Corvinone, Oseleta, Croatina and Dindarella (up to 10%). Nonindigenous grapes such as Sangiovese and Cabernet Sauvignon are also permitted (up to 10%). Amarone is made using the process of appassimento – fermentation of dried pressed grapes until complete dry – resulting in a fuller-bodied, concentrated wine with an alcohol level of 15% or higher. Ripe grape clusters are harvested between September and October. The clusters dry on straw mats called graticci or on crates in drying chambers under strict conditions. The drying process usually lasts 100 to 120 days, allowing the grapes to become shriveled, concentrating the sugars and flavors. The wine is then fermented and aged in French and/or Slovenian oak barrels. Although I was able to taste all of the wines offered at the event, I’ve narrowed it down to a few of my favorites. Bengali produces 7 wines from its vineyards (8 hectares) in San Pietro in Cariano, located within the classico region of Valpolicella. This wine is made from grapes (65% Corvina, 30% Rondinella, 5% other) that have dried for 4 months before fermentation. The wine is aged for 40 months in barriques and 2,000 liter oak barrels and then 6 to 8 months in bottle resulting in a 16% alcohol level. There were aromas of dark fruit – black cherry and raspberry, along with some cedar and smoke. The wine had soft tannins, medium body and a nice finish. Musella Winery produces 9 wines from its organically farmed vineyards (35 hectares) located just outside of Verona. This wine is made from grapes (70% Corvina and Corvinone, 20% Rondinella, 10% Oseleta) grown biodynamically that have dried for approximately 3 months, losing at least 35% of their original weight before fermentation. The wine is aged for 2 years in oak barrels of various sizes and origins and bottled for one year resulting in a 16.5% alcohol level. Only 200 cases were produced. There were aromas of stewed cherries and plums with a hint of cinnamon. The wine was juicy and acidic with a long finish and a hint of tannin. Nicolis produces 8 wines from its vineyards (42 hectares) in San Pietro in Cariano, located within the classico region of Valpolicella. This wine is made from grapes (70% Corvina, 20% Rondinella, 10% Croatina) that have dried for 3 months before fermentation. The wine is aged for 30 months in French barriques and large Slovenian oak barrels and then 8 months in bottle resulting in a 16% alcohol level. There were aromas of sweet cherry and sweet spice. The wine had medium body and a bitterness to the finish. Nicolis produces 8 wines from its vineyards (42 hectares) in San Pietro in Cariano, located within the classico region of Valpolicella. This wine is made from grapes (65% Corvina, 20% Rondinella, 10% Croatina, 5% Molinara) that have dried for 3 months before fermentation. The wine is aged for 30 months in large Slovenian oak barrels and then 8 months in bottle resulting in a 15% alcohol level. The wine was a deeper concentration of color than the younger wines. There were aromas of darker berry fruit – currants, blackberry and raspberry, along with some vanilla and almond. The wine had soft tannins, full body and a smooth, long finish. Zenato produces their signature Amarone from grapes (80% Corvina, 10% Roninella 5% Molinara and 5% Sangiovese) grown in Sant’Ambrogio, located within the classico region of Valpolicella. The grapes are dried for 4 months before fermentation. The wine is aged for 36 months in various sized French oak barrels and then rests in bottle resulting in a 16.5% alcohol level upon release. There were aromas of sweet, dark cherry along with smoke and sweet spice. The wine had medium body with sweet, soft tannins. Last week I attended the Wines of Portugal Academia do Vinho presented by Doug Frost. It was a great opportunity to learn more about Portuguese wines (which I know very little) from one of the most well-respected sommeliers in the world. We tasted 20 of the best wines from Portugal. We learned about the history of Portuguese wine, climate, geography, soil, classification laws and varietals. Until recently, Portugal’s table wine industry has remained in the shadows of its celebrated Port, which has been produced in the Douro River Valley for many centuries. Portugal created its first delineated area of Douro in 1756, establishing regulations for Port production to ensure quality and reputation. In 1908, Portugal created Regiao Demarcada (defined and regulated regions) beginning with Vinho Verde. 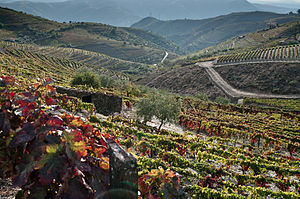 When Portugal joined the European Union in 1986, a four-tier appellation system was implemented to further define geographic boundaries, grapes, techniques and standards. This updated classification, along with the implementation of new technology and an increase of single quintas (estate-bottled) wine production, has led to improved quality and international recognition. Portugal can be divided into three main growing regions based on geography and climate. The coastal region runs along the Atlantic Ocean with moderate temperatures, coastal breezes, wet winters and high rainfall. The mountainous inland region has a continental influence of warm summers, cold winters and low precipitation. The southern region is influenced by the Mediterranean Sea with dry, hot summers and mild winters. Portugal is the 11th largest producer in the world with over 750,000 cases of wine produced annually and Portugal is the 7th largest exporter to the US. There are 250 indigenous varietals, with many varietals used in blends. The white wines range from light, fruity and crisp to nutty, full-bodied and rich. Arinto, Alvarinho, Encruzado and Ferao Pires are the most popular varietals, bottled on their own or in blends. The red varietals are medium to full-bodied with fruit and savory components. They are generally blended with a number of other grapes to produce a complex and powerful wine. Some of the most popular red varietals include Baga, Castelao, Tinta Roriz, Touriga Franca and Touriga Nacional. There are numerous delineated wine regions. I’ve listed the most well-known appellations and their most popular wines. The wines I tasted from Portugal were interesting, unique and delicious. They were a great value, with many priced in the $10 to $15 range. I look forward to trying more wine from this region in the near future. Last night I opened up a 2007 Hirsch Vineyards Pinot Noir San Andreas to drink with dinner. I was grilling pork loin marinated in chipotle and raspberry and I thought that the wine would pair nicely with dinner. Fortunately I planned ahead and was able to decant the wine for about an hour. The wine was a beautiful garnet color, although very transparent. The wine had the sweet aromas of fruit candies and red berries. The wine was juicy with mouth-watering acidity and sour cherries dominating the palate along with oak tannin. The 2007 Hirsch Vineyards San Andreas was a fine example of a fruit forward California Pinot Noir. Hirsch Vineyards is located on the extreme Sonoma Coast along the San Andreas Fault. David Hirsch founded the vineyard in 1980 with a vision to grow fruit reflective of the terroir and make site-specific wine. Hirsch Vineyards covers 72 acres consisting of over 60 distinct farming blocks, individually developed based on soil, exposure and topography. The blocks are farmed, harvested and vinified separately. Hirsch produced 1,642 cases of the 2007 San Andreas, blended from twenty-six fermentation lots comprised of the fruit from thirty-six farming blocks. The wine was aged in 100% new French oak before being bottled unfined and unfiltered at 14% alcohol. My husband and I went out for dinner with another couple last week to one of our favorite restaurants – The Blue Bottle Cafe in Hopewell, New Jersey. We brought two great bottles with us since our friends enjoy wine as much as we do – a 2003 Château Pavie and 2009 Aubert Chardonnay Ritchie Vineyard. We were a little early so our server was kind enough to decant the red so it would have a chance to open up a little. We started with the Aubert. This was my first time trying the Aubert Ritchie Vineyard (although I have tasted Aubert’s Lauren Vineyard and Ramey’s Ritchie Vineyard). It was just as expected – bold, lush, and velvety. Did I mention this was a chardonnay? The color was a deep golden honey with a little cloudiness. There were aromas of stone fruit (peach and apricot) along with lemon curd. The wine was rich and full-bodied with a beautiful finish. There was more stone fruit on the palate along with honey, citrus and sweet spice. This wine paired nicely with our salads – three of us ordered the Blue Bottle Salad which consisted of mixed local baby greens, sliced red grapes, toasted hazelnuts and shaved Manchego tossed with a red wine and honey vinaigrette. The Grilled Nectarines Salad was also ordered – mixed local greens were topped with almond crusted goat cheese, grilled nectarines, toasted almonds and tossed with a roasted Vidalia onion vinaigrette. 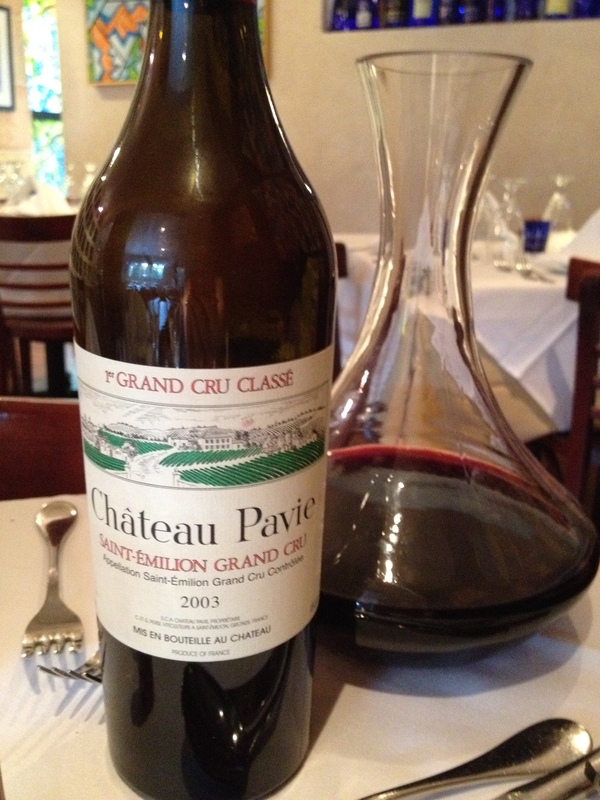 The 2003 Pavie was just starting to open up by the time we started our entrées. Two of us ordered the Duo of Beef: Wagyu tri tip and smoked beef brisket with Jersey corn polenta and summer slaw. Although this dish sounds heavy for a summer meal, the polenta and slaw really brightened up the tender beef. The grilled paillard of Berkshire pork with roasted new potatoes, wilted spinach, tomato, fennel, red onion, pine nuts with lemon vinaigrette was ordered by the other diners. The lightly dressed produce topped the smoky pork loin relaying the feeling of a summer bbq. The wine opened up but I wish we could have given it a little more time. It was big and ripe with dark fruit, mineral and oak. The wine was full-bodied with soft, chewy tannins and dark fruit on the palate. We all enjoyed the wine but agreed that it still needed more age and we would probably wait a while to crack open the next bottle. It was a great evening of food, wine and conversation and we are looking forward to the next double date! Note: There has been some heated debate over the ratings given to the 2003 Château Pavie. Roger Voss wrote an interesting article ” Robinson, Parker have a row over Bordeaux“, which magnifies the rating disparities within the industry. There is also another article by Oliver Styles “Parker and Robinson in war of words” that specifically details the ratings feud between Robert Parker and Jancis Robinson. This was bottle #2 from a case we purchased (on speculation) at auction a while back. We have enjoyed the wine and look forward to drinking more in the future. The Blue Bottle Cafe is located in the historic, eclectic town of Hopewell, New Jersey. Hopewell’s streets are lined with old Victorian homes, galleries, restaurants and shops. The Blue Bottle Cafe was opened in 2006 by husband & wife dynamic duo – Rory and Aaron Philipson (they met at CIA). Aaron is responsible for the delicious and inventive cuisine out of the kitchen and Rory manages the front of the house along with her duties as pastry chef. The menu changes seasonally. There are always new and exciting dishes to try. The predominantly American cuisine is infused with asian and mediterranean influences. Starters include PEI mussels with applewood smoked bacon, Gorgonzola, white wine and rosemary or duck confit and udon noodles with duck soy broth and sous vide quail egg. The salads are reflective of local produce in season. There is a wide range of entrée options such as pan seared yellowfin tuna with marinated garden vegetables, red wheatberries, yellow string beans and cerignola olive tapenade or house made pecorino gnocchi with toasted garlic, kalamata and cured Moroccan olives, capers, tomatoes, and wilted arugula. The desserts are amazing and made in-house. Try the banana almond financier with fosters style banana caramel and toasted almond ice cream or the dark chocolate and hazelnut tart with Nutella anglaise and whipped cream. The menu always includes vegetarian options and the kitchen is very accommodating to gluten, dairy and other allergies. Their meats and poultry are 100% antibiotic and hormone free. They do not have a liquor licence and there is no corkage fee. The menu is available online so it’s easy to plan ahead and bring a favorite bottle! Reservations are optional but strongly suggested. The Blue Bottle Cafe is also open for lunch too. Mark Aubert produced approximately 1,600 cases of the 2009 Ritchie Vineyard under his Aubert Wines label which he founded in 2000. Mark Aubert has been the winemaker and/or consultant for such notables as Peter Michael, Colgin, Sloan, Bryant and Futo. The 2009 Aubert Chardonnay Ritchie Vineyard was made from grapes sourced from the Ritchie Vineyard site, located on a bench above the Russian River near Forestville in the Sonoma Coast AVA. This vineyard was planted in 1972 by Kent Ritchie, which makes it one of the oldest Chardonnay sites in Sonoma. The Ritchie Vineyard is one of the top Chardonnay vineyards in California. Its grapes are sold to Ramey, Paul Hobbs and Dumol. The Ritchie Vineyard is also one of the coldest Chardonnay vineyard sites in Sonoma due to its proximity to the Russian River and Pacific Ocean (cooling coastal fog). The wine is fermented in new French oak and goes through additional malo-lactic fermentation. The wine is bottled unfined and unfiltered at 15.1% alcohol. Château Pavie is located on the southern part of the St. Émilion slope in Bordeaux. There is a long history of winemaking at Château Pavie starting with vineyard records dating back to the 4th century AD. In 1855, negociant Ferdinand Bouffard began purchasing adjacent vineyard sites until he reached 50 hectares in a single block, which he named “Pavie”. This block also contained a separately managed vineyard site which Bouffard would eventually break off named Pavie-Decesse. Château Pavie achieved Premium Grand Cru Classé B ranking in the official classification of St. Émilion wines in 1955. To date, there are only two St. Émilion wines classified above Château Pavie – Château Ausone and Château Cheval-Blanc. Château Pavie was purchased in 1998 by Gerard Perse, who also owns/manages Château Pavie-Decesse, Château Bellevue Mondotte and Château Monbousquet. Gerard Perse has spared no expense to improving the quality of Château Pavie. He has built new winemaking facilities and implemented a replanting program to better match the grape varietal to the terroir. Château Pavie consists of 37 hectares (approximately 90 acres) which is planted with 60% Merlot, 30% Cabernet Franc and 10% Cabernet Sauvignon. The vineyard is divided into three distinctly different terroirs (a limestone plateau, slope with dense deep clay and the slope base with sandy clay and gravel) which provides natural drainage. Soil, south-facing exposure and frost-resistant topography contribute to the success of Château Pavie. Château Pavie produces under 7,500 cases a year. The wine is fermented in 100% new French oak for 28 months and is bottled at 13.5% alcohol. I recently had some girlfriends over for drinks and we unanimously decided on Pinot Noir. I cracked open three very different bottles from California – 2006 Calera Selleck Vineyard, 2009 Capiaux Cellars Widdoes Vineyard and 2008 Brewer-Clifton Santa Rita Hills. We started with the Calera Selleck Vineyard. This was our first time trying the Selleck Vineyard so we were all a bit curious. I’ve tasted the 2006 Calera Mt. Harlan Cuvee before (which was great) and was excited to try another Pinot Noir from Calera. The wine was well-balanced with medium body and a smooth and silky finish. There were aromas of cherry, raspberry, spice (ginger and cinnamon) and a hint of mineral. Black cherry and anise dominated the palate. We all loved it and were a little sorry to have kicked the bottle so quickly. We then opened the Capiaux Widdoes Vineyard. This wine was more fragrant with strawberry, currant and earth on the nose. The wine was smooth on the palate with flavors of red fruits – cherry, strawberry and currant. This wine was preferred by one guest for its fruit forward style. We finished with the Brewer-Clifton Santa Rita Hills Vineyard. This wine had more fruit on the nose than palate. It had aromas of cherry, raspberry, spice with an underlying earthiness. The wine had a smooth finish with less fresh fruit on the palate, more savory with dried berries, cocoa, spice and earth. It was a good wine but a little underwhelming. I am a big fan of Brewer-Clifton wines. I have tried many of their Chardonnays and Pinot Noirs over the years. I seem to prefer their single vineyard wines due to their character and complexity. We enjoyed all three wines but Calera seemed to be the strong favorite. Even though they were all Pinot Noir, the wines were very different due to their climate, soil and geography. There were differences in how and where the grapes were grown and the wine was made. We look forward to drinking more wines from all three producers. The Selleck Vineyard is located on Mt. Harlan along the central coast of California, approximately 25 miles east of the Monterey Bay Peninsula. Mt. Harlan is a monopole which means it is an area that is controlled by only one winery – Calera. Mt. Harlan AVA (American Viticultural Area) is 7,400 acres and sits at an elevation beginning at 1,800 ft above sea level. Planted in 1975, Selleck Vineyard is 4.8 acres with a south and southwest facing exposure. Calera produced less than 800 cases of this wine from 100% Pinot Noir grapes. It was aged for 16 months in French oak (30% new) and bottled at 14.2% alcohol. Widdoes Vineyard is located in Green Valley AVA within the Russian River Valley AVA in the heart of Sonoma County. Capiaux Cellars contracts 1.86 acres of the Widdoes Vineyard from Dutton Ranch (27 acres in total). Widdoes Vineyard is made from 100% Pinot Noir grapes planted in 1990 with an east facing exposure. The 2009 Widdoes Vineyard was aged in French oak (40% new) before being bottled unfined and unfiltered at 14.4% alcohol. Capiaux Cellars produced only 195 cases of the 2009 Widdoes Vineyard. The Santa Rita Hills is blend of Pinot Noir grapes grown from vineyards within the Santa Rita Hills AVA. These vineyards include Mount Carmel, 3-D, Machado, Ampelos, Zotovich and Sebastiano. This wine region is known for variations in soil, exposure and micro-climates. This AVA is considered a cool climate region due to its close proximity to the Pacific Ocean and has a long growing season. The Brewer-Clifton Santa Rita Hills wine is considered their introductory wine with around 1,900 cases produced. This wine is bottled at 14.5% alcohol. I wanted recommend two great Italian red wines from Tuscany under $25!! These wines are easy to drink, food friendly, widely available and delicious. Famous producers create these wines as “second vin” but still deliver a first class product. These wines pair well with aged cold cuts, hearty pasta sauces, grilled, broiled or boiled meats with spicy sauces and fried vegetables – all staples of Tuscan dining! Antinori is a famous producer known for its world-class wines from Tuscany – Tignanello, Solaia, Guado al Tasso and Pian della Vigne. Grapes for Villa Antinori are sourced from their estates all over Tuscany – a blend of 55% Sangiovese, 25% Cabernet Sauvignon, 15% Merlot and 5% Syrah. The wine was aged for 12 months in 60 gallon oak barrels (French, Hungarian and American) and released 8 months after bottling with 13.5% alcohol. This wine is full-bodied with aromas of cherries, chocolate, smoke and spice. Visit Marchesi Antinori for more information on this wine and others produced by Antinori. This wine is second to Castello di Fonterutoli. Grapes are sourced from five different vineyard sites within the appellation of Chianti Classico DOCG – 90% Sangiovese and 10% of Malvasia Nera, Colorino and Merlot. The wine was aged for 12 months in French barrique (40% new) and released 3 months after bottling with 13.65% alcohol. The wine is well-balanced, with dark berries, fresh spice, and a smooth finish. Visit Marchesi Mazzei for more information on this wine and others produced by Mazzei.